- Doug demands for Jim to deny being in love with his wife, but Jim can't. Doug is about to hit Jim but Pam stops him. - George tells Debbie and Rick about his brother Terry having had chemotherapy but now there's nothing they can do. - Madge has been locked in the store room at the Waterhole. She cries out for help. Benito, Cathy and Hannah are dancing at Madge's party, as are Beth and Cameron. (Benito's dance moves are a hilarious sight to behold.) Hannah tells Cathy that her parents are working tonight, and Toby's babysitting. Cathy says he's doing a terrific job. 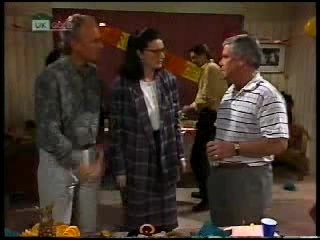 Lou tells Jim and Toby about his plans to stop Benito changing the name of the car yard. JIM: Why do I get the feeling that you had something to do with it? LOU: Me? Jim, how you could even think such a thing? TOBY: He knows you Mr Carpenter. JIM: Yeah, I don't reckon it'll take long for Benito to get onto you either. LOU: Oh I can run rings around him. JIM: He's a pretty clever bloke, mate. LOU: He may be clever, but I'm devious, and believe me, devious always wins. Doug arrives and sees Jim at the party. Jim thinks he should make himself scarce but Lou says he can't go, Madge will be upset if Jim isn't here, she's upset enough that she won't get to see Helen before she goes. Lou goes to talk to Doug. Lou thanks Doug for coming, Doug had to say goodbye to Madge. Lou wonders if he's seen her, but Doug says she left the Waterhole an hour ago. Lou thinks she should be here soon. Madge bangs on the store room door and yells for someone to let her out. Helen calls reception from her bed and asks for the hotel doctor to call in again. She still has a wretched ear ache. She hangs up and tells Debbie the doctor will be here when he's free. Debbie asks if she can get Helen some breakfast, but she doesn't feel like it, she just needs rest. Rick knocks at the door and Debbie lets him in. Rick asks if Debbie will be able to get away, she doesn't want to leave Helen, but Helen insists she'll be fine. Rick and Debbie leave. Lou, Jim and Dorothy wonder where Madge could be, assuming she's stopped in at a friends to say goodbye. 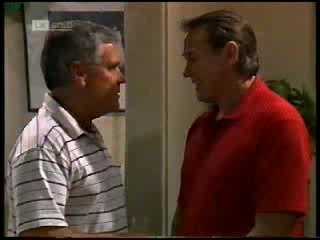 Doug tells Lou he's a bit tired so he's going home, but he'll say goodbye to Madge in the morning. LOU: So much for Madge's big surprise. While Tony, the cleaner, is hoovering loudly, Julie is on the phone trying to get through to Toby to check on Hannah but there's no answer. Julie panics that something has happened and she shouldn't have left Hannah with Toby. Philip says they will be over at Madge's farewell party at Cameron's, he gave them permission. Julie says this is the first she's heard of it and wonders why she hadn't been invited. Philip says they were asked but he must have forgotten to tell her about it. PHILIP: We can drop in now. JULIE: I don't want to ‘drop in.' If people can't be bothered to ask me properly, I won't go! PHILIP: Julie, they weren't handing out hand engraved invitations, it was all pretty casual and we'll have to drop in if you want to pick up Hannah. Philip says he needs to check the stock first, but Julie asks for him to leave it until tomorrow as she really wants to leave to get Hannah home. Philip agrees. They tell Tony to call it a night and they all leave, turning the lights off. Pam arrives at the party and asks Cameron if Doug is here, but he's left. Cameron is glad Pam's here, Madge will want to say goodbye to her if she ever turns up. Pam asks if Jim is here, but Cameron says he's left too. Pam asks if Doug has spoken to him, Cameron says that Doug definitely wants a divorce. Cameron tells Pam that Brad and Gaby are in the kitchen preparing food (I.e. not appearing in this episode), and that Brad seems to be eating it quicker than Gaby can get it ready. Pam leaves to check on them. Cameron welcomes Julie and Philip when they arrive, Julie quickly mentions that she didn't know anything about it. She goes to check on Hannah, before joining Philip for a drink. Benito and Philip start chatting, Benito says things are going very well at the car yard and it'll be a big success. Julie boasts that Philip's gotten a big deal with Gavin Heywood and it'll bring a small fortune to the Robinson Corporation. Julie says Paul will be thrilled. Cameron asks to talk to Philip for a minute. As Cameron and Philip walk away, Julie walks towards Benito to talk to him but he turns away from her. Cameron asks Philip what this deal with Gavin Haywood is. Philip says he's interested in a piece of land that Lassiters owns for a commercial development, but Philip doesn't think Gavin can use it as its residential zone. Cameron thinks that Gavin will be able to have it rezoned. Cameron thinks Gavin's a shonky operator, and thinks that he rigged the local elections and now he knows why. Gavin has his mate Percy Slade on the council to push the rezoning through for him. Cameron tells Philip to be wary of him, Philip thanks Cameron for letting him know. Cameron's going to look into the rigging, he doesn't want to see guys like that get away with it. Madge continues to bang on the door, shouting to be let out, before tiredly giving up. Lou sees Cathy and Benito out the door as the party ends. They say it's a shame that Madge didn't turn up. Cathy offers to tidy up, but Lou insists it's fine and they leave. Lou then tells Cameron and Beth not to worry about cleaning up, he has someone coming in tomorrow to do that. They say the party went very well, except for Madge not turning up. Lou wonders where she got to. Lou leaves. Beth tells Cameron it's a shame that Madge didn't turn up, and Cameron hopes that wherever she is she's having a good time. Madge is struggling to get some sleep on the floor of the store room. Lou returns home, calling out for Madge but she isn't there. He tears up the note he left for Madge. Jim arrives at the door, having seen the lights and wondered if Madge was here. Lou can't understand it, maybe he should call the police. Jim is sure she'll be visiting friends. Lou thinks he's such a gallah and should have organised things better. He really wanted to do something for her on her last night, just to show her how much people think of her. Jim says she's been part of Ramsay Street a long time, she was a Ramsay, hard to forget. He knows Helen will miss her. Lou says about half as much as he's going to. 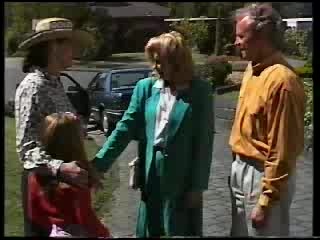 Debbie and Rick return to visit Helen. Helen tells them the doctor has said she can't travel for at least another 24 hours, so she's had to change her tickets and fortunately has some seats on tomorrow's plane. Rick says he'll change his flight too, which means they'll get to go to the football match with Terry and George. Helen says she'll have to phone Erinsborough and tell them, which means Julie will find out the truth. Debbie thinks her dad must have already told her, but Helen says if he had then they'd already have heard from her. Rick is going to call his parents to say the flight was delayed, and suggests Debbie say that she's been held up in the bush somewhere or she's been bitten by a snake. Debbie says her mum would really freak at that, she'd be up at the Bungle Bungles before anyone could stop her. Helen suggests Debbie call home and hope that Philip answers. It's the next morning, Julie wonders why Helen called at that unearthly hour, and she should have rang at a reasonable time. Julie isn't happy that Debbie is away another day when she should be back at school. It's strange that the bus is full when they had bookings. Julie thinks the whole thing has been a waste of time for Debbie. Philip says it must be a good learning experience, but Julie wonders how much learning you can do out in the Black Stump. Julie regrets letting her go. Philip is about to tell Julie where Debbie really is when a phone call interrupts them. Julie answers, before telling Philip that someone's forgotten to stock the bar at the Waterhole. Philip rushes off, telling her he'll talk to her later. Madge wakes up on the store room floor, bumping her head on a beam as she gets up. Outside, Philip notices a key still in the lock on the door. Madge calls for help and Philip lets her out. PHILIP: What are you doing here? MADGE: Oh, playing tiddlywinks. What do you reckon? I've been stuck in here all night! Madge thought someone would come back after closing time, but Philip explains he didn't restock the bar. Madge tells him he can run the bar how he likes. Philip tells her about the surprise party that she missed. She leaves in a mood, saying she hopes they all had a terrific time. Some removalists are taking furniture out of the house. Lou is making a statement on the phone to the police when Madge returns. She explains she was locked in the store room, and Lou bursts out laughing. Madge bursts into tears crying, when Lou apologises and hugs her. Madge wishes she'd spent the night here, with him. 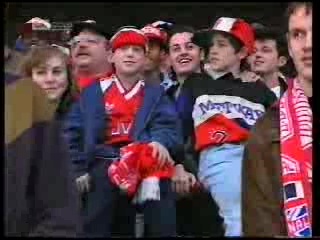 Rick, Debbie, Terry and George are enjoying an Arsenal game. Lou brings out a fold out chair for Madge to sit on now that the place is empty of her furniture. Madge can't believe she's leaving. MADGE: You know I was really unhappy when I first arrived. I'd split up with Fred and I was a mess and I came running to Ramsay Street. LOU: That's not such a bad idea. MADGE: No, it wasn't. And then Charlene came, and then Henry. I wouldn't say they were easy times but then I met up with Harold again and we got married and became a proper family. You know, I was a real prig when I first arrived. MADGE: Oh, yes I was. I was so tense and bruised, I wouldn't let the world touch me for a long time. But good friends and caring people can work wonders. They helped me to let go and be myself again. Oh I'm going to miss it here. Lou reminds Madge she has a plane to catch. Madge stands up to leave and looks around at the empty house. She gives Lou a hug, saying she's sorry it didn't work out for them. She does love him in her own way. Lou says he'll always love her. Lou carries her bags outside while Madge has a final look around the house. Madge walks down the steps of her house, to find her neighbours there, giving her a round of applause. Toby and Bouncer climb the stairs to her. Toby can't wait to visit her in Queensland, Madge wants him to visit often, giving him a hug. Madge hugs and says goodbye to Pam, Cameron, Beth, Cathy, Benito and Hannah. She kisses Jim and tells him they'll keep in touch. She asks him to get Helen to call her when she gets back. Jim says they've been delayed, but agrees to tell Helen that Madge is sorry she missed her. Madge says the two of them mean a lot to her. Lou rushes down to load the car. 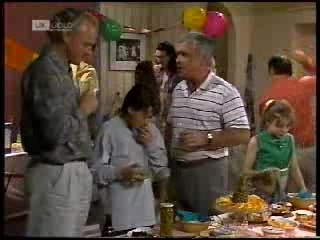 MADGE: I'm going to miss all my friends in Ramsay Street. MADGE: Oh yes, and enemies. Bye bye. As Madge heads down to the car, she turns and waves goodbye before blowing them a kiss. 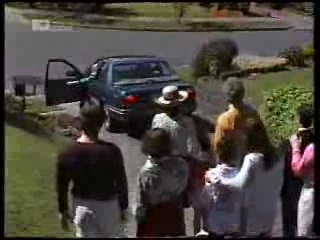 Everyone says goodbye, as Lou drives the car out of Ramsay Street. 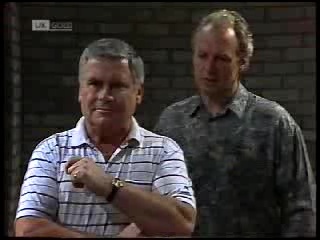 Cliff asks Casey when those two Aussie kids were going home. Casey thinks it was yesterday. Cliff says the interview was picked up by the Australian news media and were asking for clearance. Casey says they'll be home by now so their parents will know all about it, so it'll be okay to release the material, it can't do any harm now. Philip and Hannah are watching TV together when Julie returns home. She has checked Cameron's after the party, and says Helen won't be at all pleased. Philip thought that Lou was bringing in a professional, but Julie says there are stains on the carpet and marks on the walls. Philip tells Julie off for snooping, but Julie says she was only there to see if Cameron has found out anything more about Gavin Heywood. Hannah shouts on her parents to see the TV, it's Debbie and Rick. Julie turns to see Debbie on the TV being interviewed. Debbie tells the interviewer that her mum doesn't know she's in England. Julie is shocked and upon realising that Philip knows that Debbie is England, she demands to know what is going on.